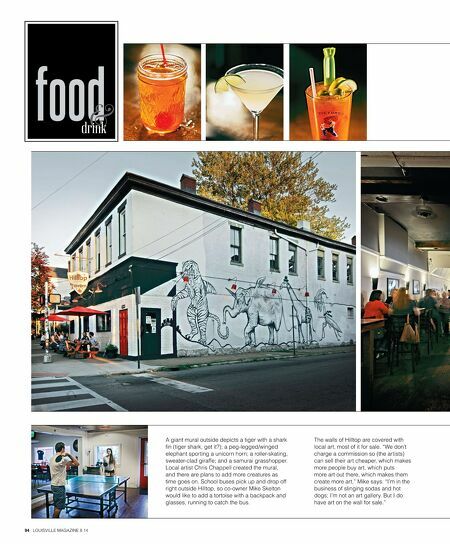 94 LOUISVILLE MAGAZINE 8.14 food drink A giant mural outside depicts a tiger with a shark fn (tiger shark, get it? ); a peg-legged/winged elephant sporting a unicorn horn; a roller-skating, sweater-clad giraffe; and a samurai grasshopper. Local artist Chris Chappell created the mural, and there are plans to add more creatures as time goes on. 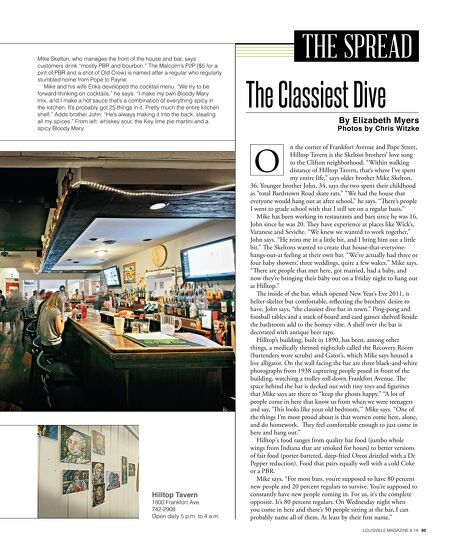 School buses pick up and drop off right outside Hilltop, so co-owner Mike Skelton would like to add a tortoise with a backpack and glasses, running to catch the bus. The walls of Hilltop are covered with local art, most of it for sale. "We don't charge a commission so (the artists) can sell their art cheaper, which makes more people buy art, which puts more art out there, which makes them create more art," Mike says. "I'm in the business of slinging sodas and hot dogs; I'm not an art gallery. But I do have art on the wall for sale."